This was the message that I had on the placard I made for yesterdays wildlife protection/anti-hunting demonstration outside Downing Street. Why did I chose this quote? Because it says it all. If a Government is prepared to savage a wild animal in the most inhumane way they can possibly think of in the name of sport then what makes you think they’ll treat humans any better. We all know that animals are innocent creatures which have been on this planet a lot longer then us and at the end of the day their main aim is to survive. They may do small harm to humans but certainly not as much harm as we do to them. 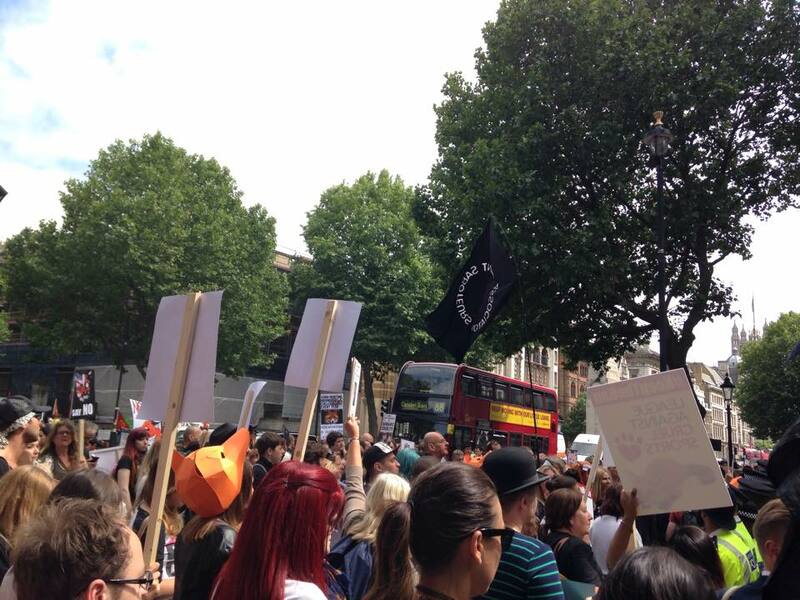 Over the last few days there has been two big protests in London against any amendment or repeal of the Hunting Act. Unfortunately I really couldn’t make Tuesday’s demo but I made sure I was there yesterday to join those in making it clear that we want British wildlife to be left alone and not be a victim of cruelty. 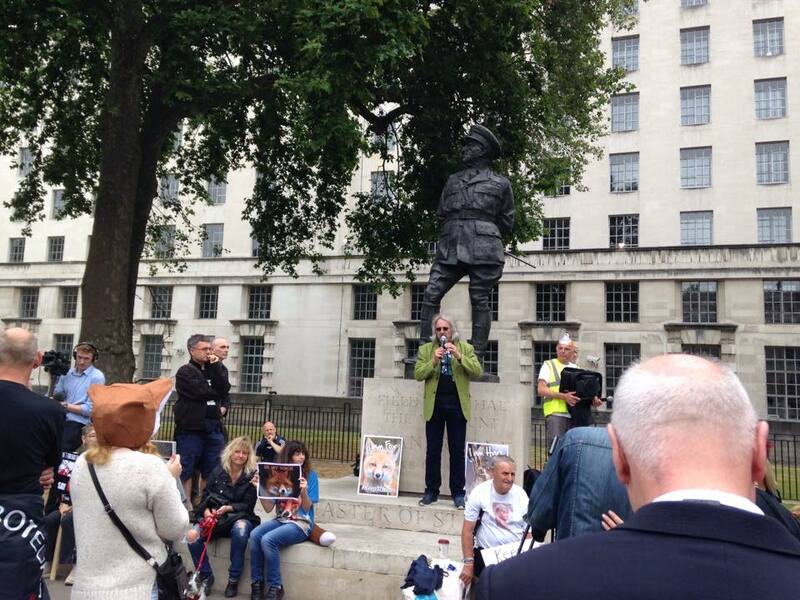 People from all different backgrounds joined yesterday to show their support, whether they were young or old or from different areas of the country, we all united outside Downing Street to show that not only us but around 80% of the country do not want any repeal or amendment of the Hunting Act. As well as this, it wasn’t just the welfare of foxes that we were protesting for. It included all British wildlife like hares which would be affected by a repeal due to hare coursing, deer, they’d be hunted, badgers, a creature that has been heavily targeted by government policies in the past few years and can be affected by hunting in many different way, and many other species. 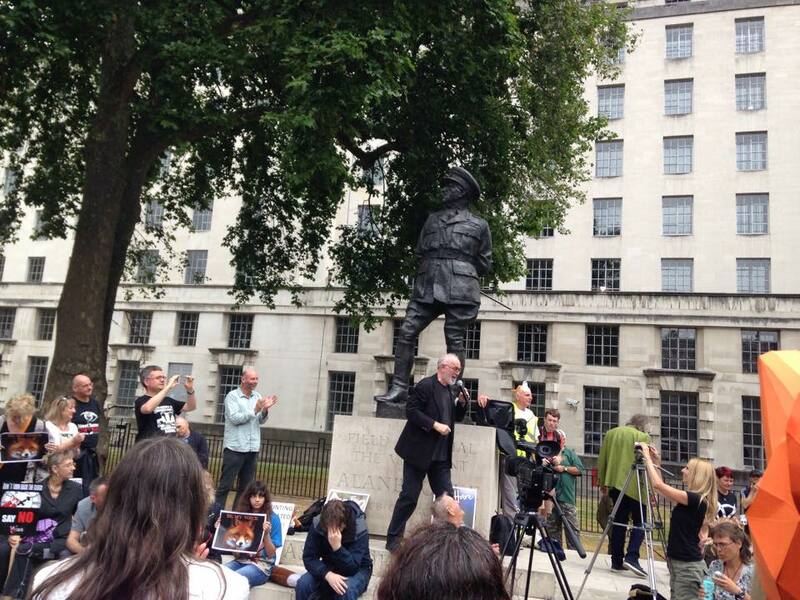 However today was mainly to do with the repeal of the Hunting Act after the weeks commotion. I say repeal or amendment but repeal is the word I should be using. Even though the Government and the media are saying amendment it is basically a repeal. The Tories are saying that they want to change the law so it’s in line with Scotland, where they use a limited amount of dogs unlike England where two dogs can be used. By doing so it would make it almost impossible to prosecute. Due to this animal charities, like the RSPCA, are accusing the government of approaching an abuse of power with its efforts to bring back hunting by the back door. On Tuesday though the vote was called off after SNP announced it would be voting against a repeal. When they first announced it this was fantastic news as it was obvious that the ban would stay where it is. However Cameron didn’t seem to like this so spat his dummy out and cancelled the vote. Even though this may sound like good news, especially as under the current EVEL policy SNP would still be able to vote, it’s obvious that Cameron and his chums have some slimy plan up their sleeves. This will be one to watch. In the mean time, as the vote has only been postponed, please get in contact with your local MP and try to make sure that they will not be voting to repeal. 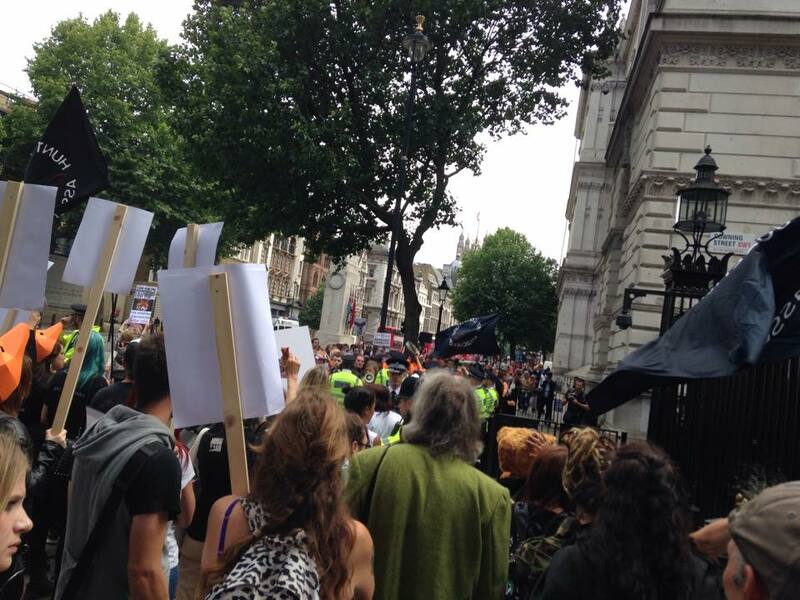 Yesterday, at 12.30pm everyone began to gather at Richmond Terrace which is opposite Downing Street. By 1pm there was a good crowd and the speeches began. Everyone who was there looked great, they either had banners, posters, placards or they were dressed up, wearing hats or had fox masks and overall looked the part. We made a great impression as lots of people walked past. We were also joined by one delightful (sarcasm) man who was a master of a few different hunts and showed no shame whatsoever. First to speak was Chris Williamson (ex-Labour MP for North Derby). He spoke at the BAWC conference earlier this year which was a great speech and so was yesterday’s. 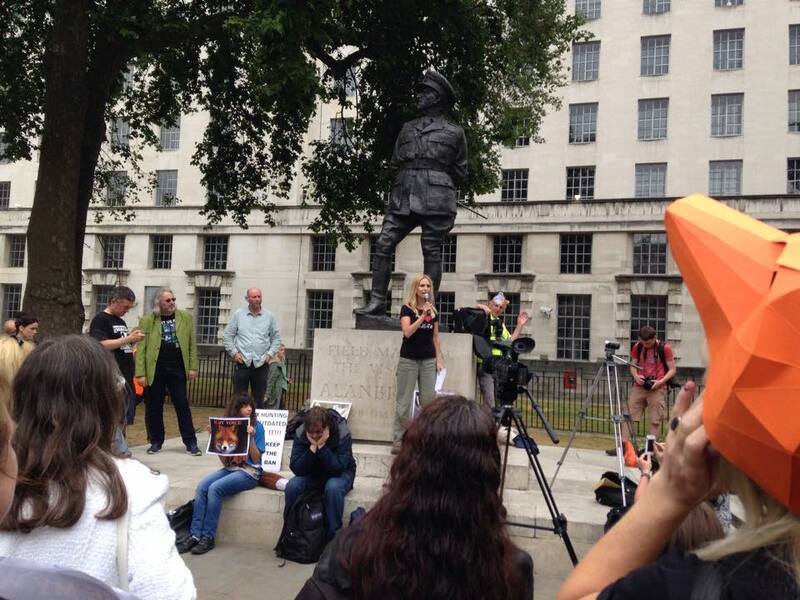 Next to speak was Dominic Dyer, CEO Badger Trust, who normally speaks at the stand up for wildlife and badger marches. Followed by Lynn Sawyer who I’ve also heard talk at past events and then Peter Egan who is an actor and animal welfare campaigner. This was then followed by Luke Steele, animal welfare campaigner, then Anneka Svenska who is a wildlife and Eco presenter. Finally it was Peter Martin who is the chairman of the Badger Trust and an animal welfare campaigner. After the array of brilliant speeches we then gathered opposite Downing Street for a while before crossing the road and standing right outside the gates. Whilst doing so everyone was shaking their banners and signs, shouting VERY loudly, blowing whistles and much more. Overall we made lots and lots of noise which was fantastic! I thought it was great that we could stand here as we definitely got some attention by people passing by and tourists. Again, even though the vote had been postponed it was still very important to make it clear that we don’t want any repeal now or in the future. This was also made clear by some of the chants. A few were “shame, shame, shame on Cameron”, “blood, blood, blood on his hands”, “No excuse for animal abuse”, “No more killing, no more fear, we don’t want fox hunting here” and a few more too. Here are a few photos I took. Hi Georgia, really interesting post on the demonstration. On wildlife protection, are you aware the EU’s looking at weakening key laws which protect European wildlife? The Birds and Habitats Directives (the European laws which help safeguard thousands of bird, animal and plant species) are currently under review, but we think the evidence speaks for itself. The directives have stopped the decline of a number of species and have created a huge network of conservation areas. Thank you for making me more aware of this issue. I had heard about it and signed the campaign but I will look into it more and post a blog to help. Fantastic! Thanks so much for your help Georgia – we’re at more than 467,000 signatures, would be great if we could reach half a million by tomorrow night! A very interesting read, I care for animals as a profession but really it’s my life, I campaigned against lifting the bam on Fox hunting, wrote to my MP and got a very positive response letter. It’s so important to fight for the rights of those that can’t fend for themselves. I’ve recently volunteered on a great white shark conservation In south Africa which was amazing. We need to help prevent the mass extinction of all animals land and sea! You can read about my experience on my blog 🙂 I’ve just developed my blog and writing about lot of things that are of interest and can help people and animals in ways by sharing my experiences and knowledge. I enjoyed reading your blog and would be great if you could have a look at mine, any comments would be great on what you think about the subject I’m writing about. Also please follow me 🙂 going to start doing more posts on animals and the animals I take care of at work.